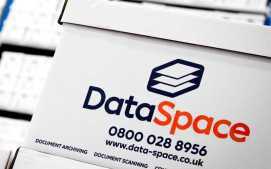 DataSpace are dedicated Document Management specialists based in the North West, providing flexible and compliant Archive Document Storage services to businesses, and organisations across the entire of the UK. Do you have too much paperwork and not enough space? Are you using alternative storage areas to keep your records for example your garage, basement or a self-store facility? If you do, then off site storage is for you. You could use the space currently housing your documents a lot more effective, and even generate an income from it. Have you considered the security of the storage environment you’re using? Are your documents safe from such factors as damp, flooding and pests? If your documents are not safe, you could be breaching the Data Protection Act and be risking your businesses reputation!! Compliant Document Management and Storage providers are easy to identify, including accreditations of relevant British Standards such as PD5454, ISO27001, BS10008 and registration with the ICO. Call us Today on 0800 028 8956 for a Document Storage Quote! Or email us info@data-space.co.uk.